SENDAI (Kyodo) Archaeologists have discovered the remains of what they believe to be Japan's oldest human habitation in a layer of earth about 600,000 years old in Kamitakamori, Miyagi Prefecture. The archaeologists  from the Tohoku Paleolithic Institute, Tohoku Fukushi University and other institutes said Monday they believe that the finding may be one of the oldest in the world. There are only a few remains of human dwelling structures from the Early Paleolithic period in the world, as early humans such as the Peking Man lived in caves. Similar remains found in Germany are believed to be 400,000 years old. At the site, the archaeologists found several pits into which the pillars for two buildings were likely placed, the archaeologist said. 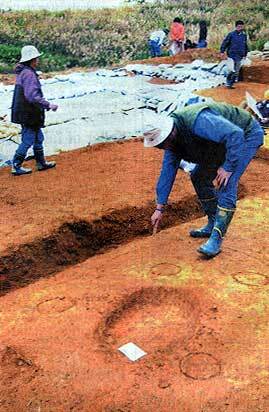 The latest finding predates by 100,000 years one in Chichibu, Saitama Prefecture, that had been considered the country's oldest. Hiroshi Kajiwara, professor of archaeology at Tohoku Fukushi University, said: "The pits may be similar to the ones in Chichibu. We would like to investigate the findings carefully." The archaeologists found five pits at one location and eight pits at another. The site with five pits, which measure 15 cm to 20 cm in diameter, showed evidence of a round building measuring 2 meters in diameter, they said. The other site, located 5 meters east, had eight pits measuring 20 cm to 30 cm in diameter, which surrounded a hole in the center. The hole contained seven stone tools. The dwellings are believed to have been built by primitive man, or Homo erectus, who appeared some 1.6 million years ago and likely reached Japan 600,000 years ago at the latest, according to the archaeologists. The buildings could have been used as a place to rest, a lookout for hunting, a place to store hunting tools or to conduct religious rites, researchers said.